Ashley is a space studies grad student who plans to pursue a PhD in science education and a career at NASA. Not necessarily in that order. Venus has been known since at least the time of the Mayans, who used their observations of the planet to help make their calendar very accurate. The Romans later gave it its name, after their goddess of beauty and love (the Greek equivalent is Aphrodite). It is widely believed that they chose this name for the planet because it shines so brightly in the night sky; it really is quite beautiful. However, modern missions to Venus tell a very different story about the planet. It is a fiery, toxic, hellish world of extreme heat and pressure. It took these modern missions for us to learn these things about the planet because its clouds are so thick that we can't see through them--all we really see when we look at the planet is the light reflected off the cloud tops. 9. Venus Is Both the Morning and Evening "Star"
Since Venus was known by the ancients, we don't really have any way of knowing who exactly discovered it. However, though it was 'known' it wasn't correctly identified for a very long time, as they believed it to be a star. The objects known as the morning and evening stars were discovered by the mathematician Pythagoras to be the same object--but even he didn't know it was a planet, and not a star at all. We have so much in common with Venus that it's often called our sister planet. 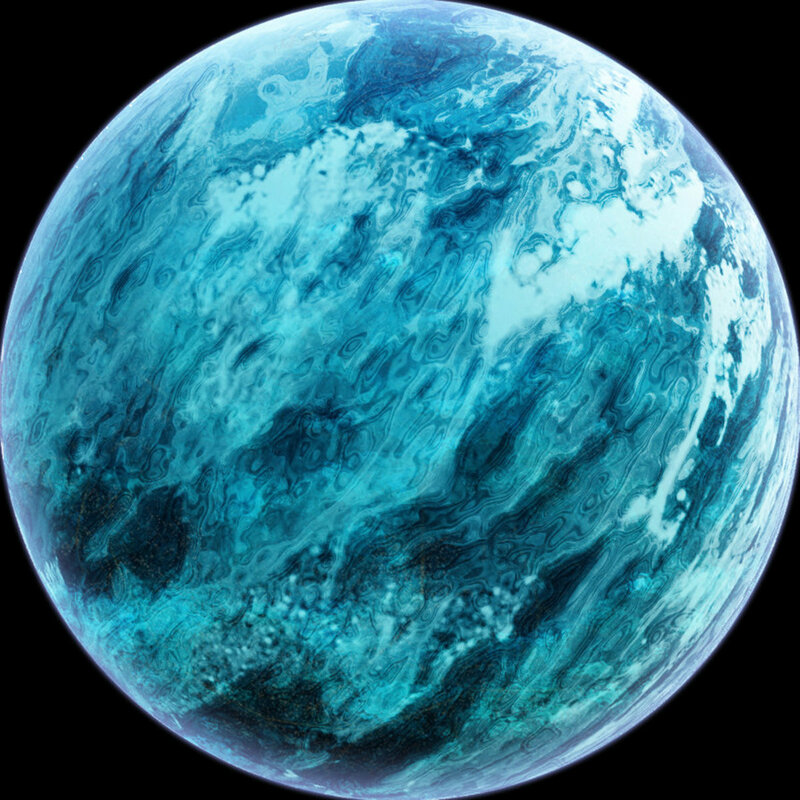 It's the closest planet to Earth and has a similar mass, gravity, size, and more (refer to table above). It is thought that a long time ago, Venus was basically our twin planet in even more ways. 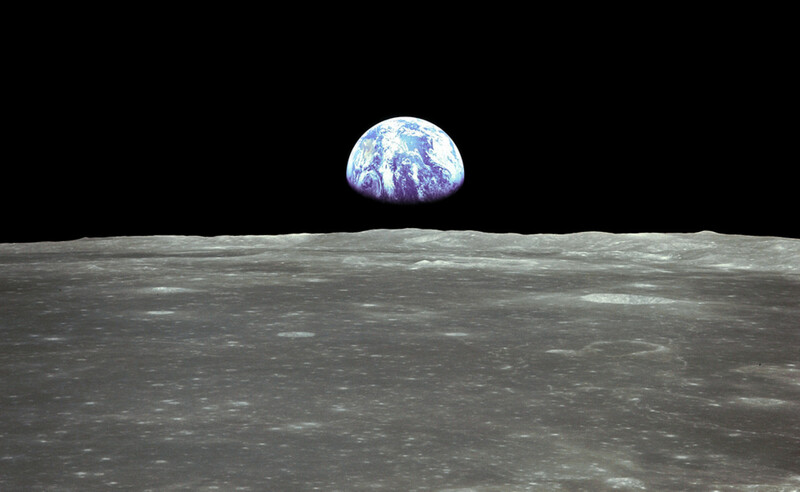 However, it's only about 67 million miles from the Sun, whereas Earth averages a distance of 93 million miles. Venus's proximity to the Sun and the composition of its atmosphere have made it drastically different from Earth in other ways. 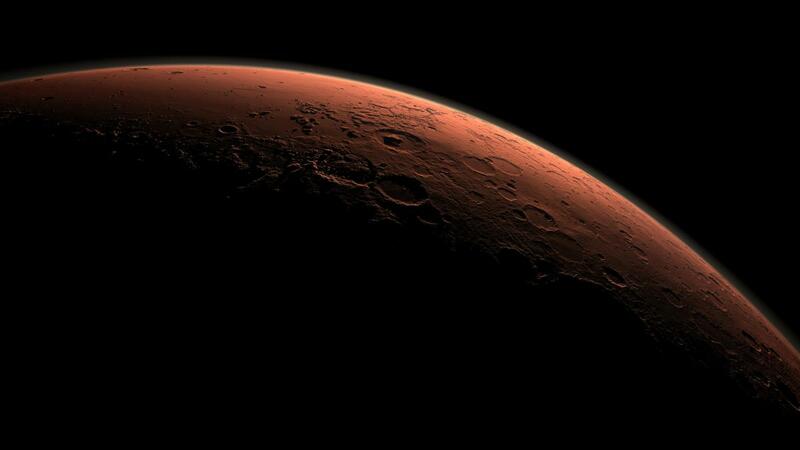 Unfortunately, though we aren't there yet we are in the early stages of what makes Venus so uninhabitable. Thick, cloudy atmospheres have an insulating effect, locking in heat. Without them, heat is much more easily radiated away and lost. Earth's deserts are a great example of this; even the hottest deserts can get very cold at night, since clouds are scarce in those areas. As a result, daytime heat is rapidly lost at night. The Venusian atmosphere, however, is very dense. It's composed almost exclusively of carbon dioxide, with lesser amounts of sulfur and nitrogen. The amount of nitrogen actually helps demonstrate just how thick Venus's atmosphere is: Our atmosphere is 78% nitrogen, and Venus has around four times as much nitrogen as Earth does--yet nitrogen makes up only a very small portion of the Venusian atmosphere. 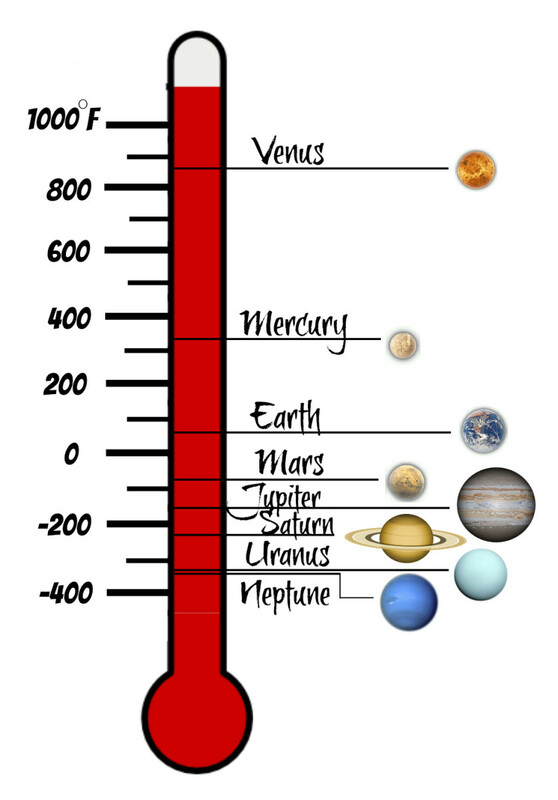 Carbon dioxide is especially good at trapping in heat, and since Venus has so much of it there's a huge amount of heat that gets locked in. This happens to such an extreme degree that it fuels a runaway greenhouse effect, which is a major contributor to global warming on Venus. 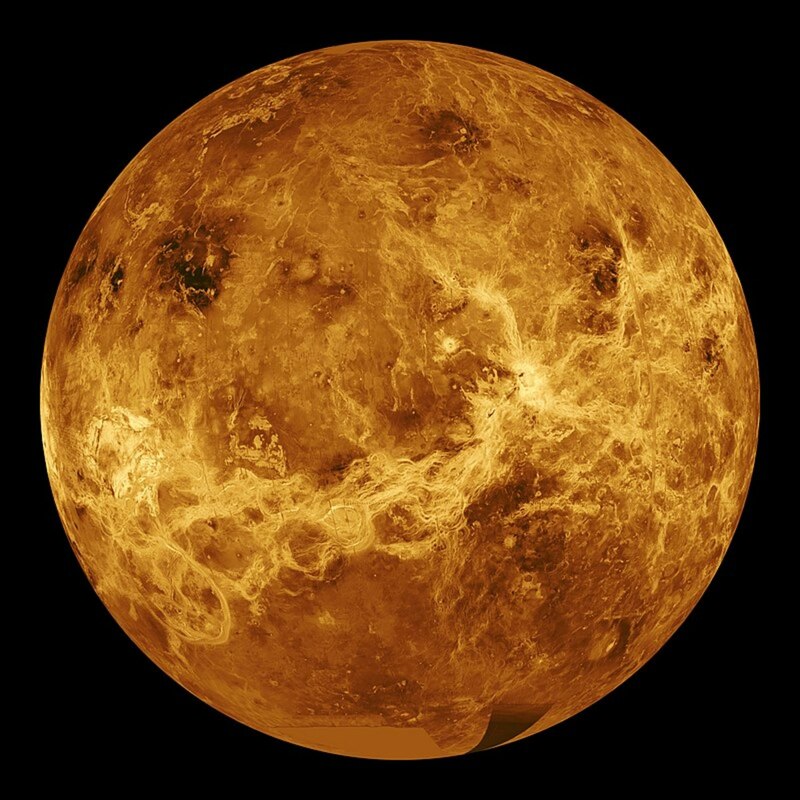 Even though Venus is almost twice as far away from the Sun as Mercury, it's still hotter. How can that be? Venus's thick atmosphere traps in tons of heat, as previously stated, but Mercury exhibits the opposite effect: it has an incredibly tenuous (thin) atmosphere, which causes it to lose heat as easily as Venus retains it. Even at Mercury's peak temperature of about 800 degrees Fahrenheit it falls short of Venus's average. The surface of Venus features temperatures up to nearly 900 degrees Fahrenheit due to its runaway greenhouse effect and proximity to the Sun. Venus appears yellowish due to the sulfur in its atmosphere. This sulfur comes in the form of sulfuric acid, which condenses higher up in the atmosphere. It then rains this poisonous sulfuric acid--but none of it ever reaches the surface of the planet. That's because on the way down it gets hotter and hotter, to the point that it re-evaporates before hitting the ground. The farther down through Venus's atmosphere you go, the less we know about it. It's really difficult to get information from closer to the surface due to the extreme heat, pressure, and amount of clouds obscuring our view. With radar we've been able to map the surface, but we still don't know as much about the composition of the surface and lower atmosphere. 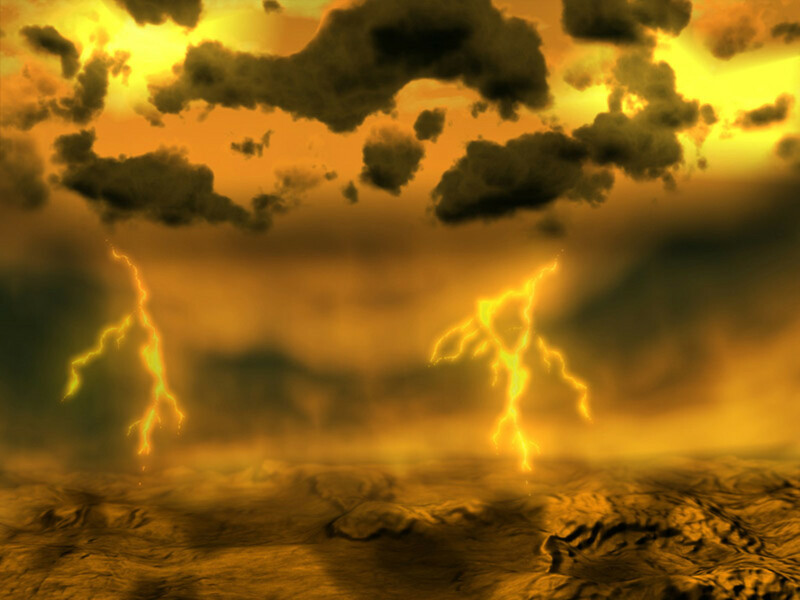 We do, however, know that Venus exhibits an exciting phenomenon--lightning. This hellish world wouldn't be complete without volcanoes--hundreds and hundreds of them! Gula Mons (pictured above) is a huge Venusian volcano, spanning over 170 miles in diameter. 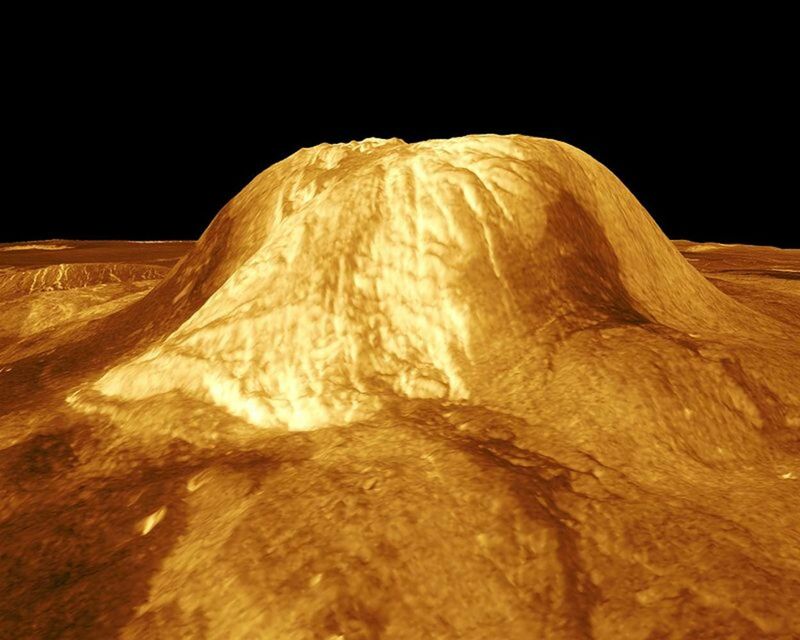 The volcanoes on Venus differ from those on Earth in a few ways. 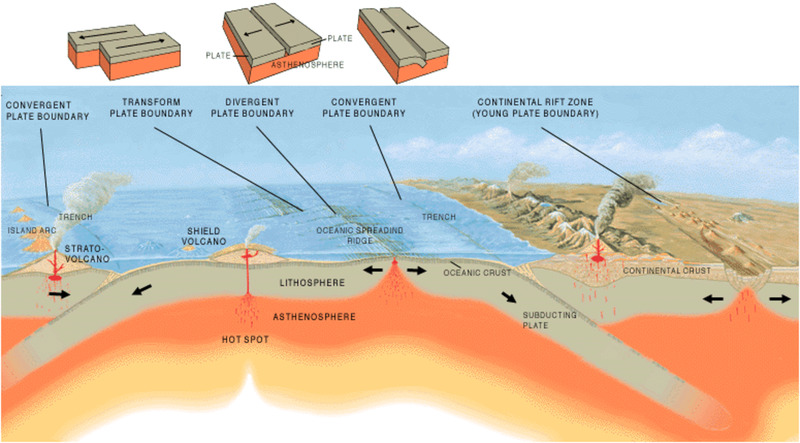 First, a lot of our volcanic activity is associated with plate tectonics. Venus, however, doesn't show signs of having similar activity as a driving force. Second, the blasting effect we associate with volcanoes doesn't happen so much on Venus. That's because it's largely water-driven, and on Venus water is scarce. As a result, Venusian volcanoes are more like gushers or oozers than the blasters we tend to expect here on Earth. We don't have proof that any of Venus's many volcanoes are active now, but it is possible. Due in part to the lava flows that have occurred on Venus's surface, there aren't very many craters. It would take a very large object to be able to survive through Venus's super dense atmosphere in the first place, but we know impacts from these large objects have occurred. Between the time of many of the impacts and now, however, there has been a great deal of volcanic activity. The lava flows have smoothed the surface, thereby lessening signs of impacts. Scientists refer to this as a "young" surface; bodies like the moon and Mercury which are heavily cratered are "old" surfaces because they haven't been altered much over a very long period of time (except by the accumulation of more craters!). While there aren't many craters, there are plenty of mountains on Venus's surface. The tallest we know of, called Maxwell Montes, is seven miles high! That's more than an entire mile taller than Mount Everest. 3. 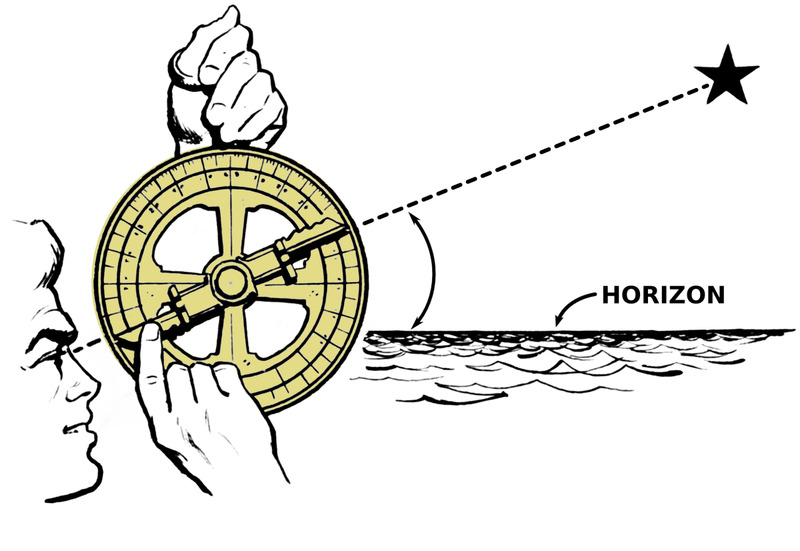 For Venus, a Day Is Longer Than a Year--And It Rotates Backwards! A day (as defined as the length of time it takes for a planet to spin around one complete time) for Venus lasts a long time--about 243 Earth days. 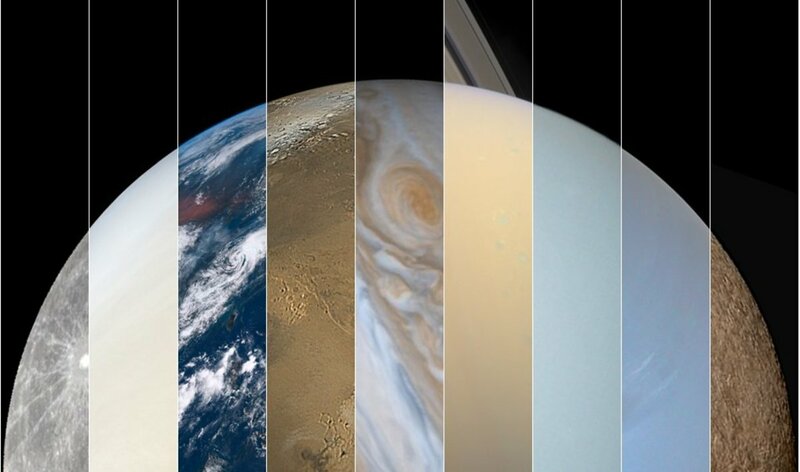 Venus spins backwards (compared to the other planets) and has the longest day of any of our planets by far. What's even more interesting is that its year is only about 225 Earth days--so its day is longer than its year! It is possible that a major collision in Venus's past caused it to rotate so slowly (and backwards). The bizarre thing is that even though Venus is spinning so slowly, its atmosphere whips around super quickly--all the way around the planet in just four Earth days! This is likely due to uneven heating of the planet's surface, which creates up- and downdrafts of air. Interestingly, the wind speed on Venus is actually increasing. 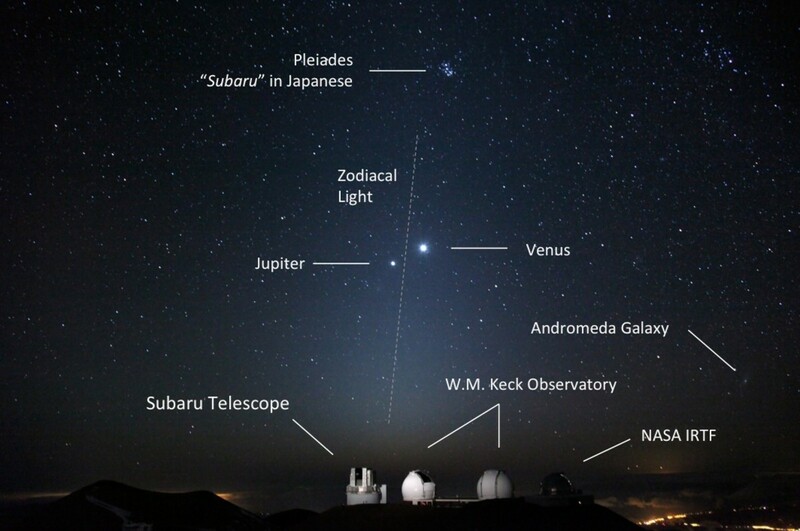 Venus Express has been helping us find out about this phenomenon as well as others. We have sent missions to Venus since the early 1960s, though several were unsuccessful. Even now, all of the probes that have made it to Venus have either melted or been crushed. The first successful mission to Venus was the US's Mariner 2 flyby. We learned about the exaggerated temperature and pressure, retrograde rotation, atmospheric composition, etc. One of the most significant applications was that it informed us that it would be exceptionally difficult to study this planet up close, due to the harsh conditions. Subsequent missions have learned more and more, and of course technology is advancing all the time--so current and future missions are even more profitable. 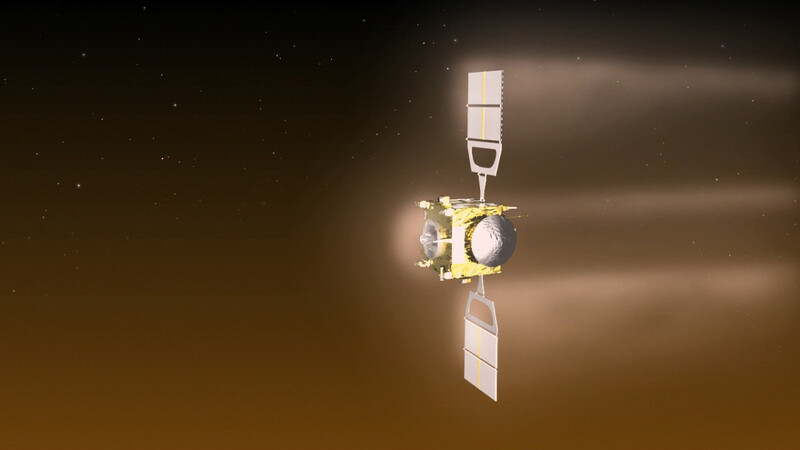 The European Space Agency's Venus Express, for example, has made some exciting discoveries in just the past decade. One thing we've learned from it is especially surprising: Though Venus is scorchingly hot, it may feature snow. High up in the planet's atmosphere is a layer that's far colder even than any part of our own atmosphere. Data from Venus Express leads scientists to believe that this layer is cold enough for the carbon dioxide to freeze. We've also learned that Venus's rotation is gradually slowing--and yet its already rapidly rotating cloud systems are actually speeding up. In addition, we've discovered that some of its volcanoes may have been recently active, it has an ozone layer, it lacks an internally generated magnetic field, and the best part: it almost certainly used to feature huge water oceans, like Earth. Though there is some water in its atmosphere, Venus still has about 100,000 times less water than Earth does. However, Venus Express has received data which strongly suggests that Venus may have had much, much more water in the past; it may have even had as much as Earth does. It's so hot on the surface that the water would have obviously evaporated into the atmosphere. From there, according to the European Space Agency, "Venus Express has certainly confirmed that the planet has lost a large quantity of water into space. It happens because ultraviolet radiation from the Sun streams into Venus’s atmosphere and breaks up the water molecules into atoms: two hydrogens and one oxygen. These then escape to space." This process is called atmospheric escape. The idea of past water on Venus isn't necessarily entirely new information. Scientists analyzed data gathered by the Galileo spacecraft in 1990 and found data which suggested that there may be a large amount of granite making up the Venusian highlands. Granite can't form without water, so if this data is correct, there must have been water there at some point. Earth experiences a similar phenomenon as that which is supposed to explain Venus's water loss--atmospheric escape. So are we headed in the same direction? Not necessarily. The process is quickened and exaggerated on Venus due to its broiling temperatures, which would have kept water in the atmosphere. On Earth, however, temperatures are mild enough to allow water to cool enough that it will condense into clouds and rain back to the surface in liquid form (as opposed to being exposed to the solar wind all the time). Due to Venus's slow, backward rotation, it seems clear that it was struck by a very large object sometime likely during its formation. Such a collision could contribute to the planet's water loss in a couple of ways. First, collisions on this scale produce an enormous amount of heat due to friction. Heat speeds the evaporation process, and more water enters the atmosphere to be subject to atmospheric escape. Second, major collisions can also strip away part of the exterior of the planet and knock material into space--the same thing that probably caused Mercury to have such a large core relative to its size. Jaxson, do you have a question about something specific? This was great - I learned a lot I didn't know about Venus. For one thing, it's a much less benign planet than I thought. I grew up on Sci-Fi stories of Venus as a wet and foggy world peopled by reptilian Venusians. Reality is so much less appealing!